Proof that the hospitality industry is advancing in an enlightened direction, fifteen of the top 40 dining rooms selected for our "2006 Restaurant Issue" are located in hotels. Today's lodgings play host to some of the biggest names in the food world, from Jean-Georges Vongerichten to Michel Richard. Like an extraordinary wine and cheese pairing, the right combination of hotel and restaurant is spiritually moving. We love the idea of dining out and then wandering down the hall to our suite for a sweet, sated night's sleep. Because we assume you do, too, we're delighted to offer our recommendations for the best hotel restaurants in the country. Those looking for a cool, refreshing oasis in the desert will find it here, under the guiding culinary hand of chef de cuisine Bradford Thompson. 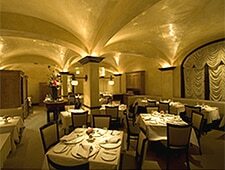 He developed his skills with predecessor James Boyce and, prior to that, Daniel Boulud in New York. His modern French style, fusion of old and new techniques, and acclaimed seasonal tasting menus—plus a $3 million wine collection—are highlights at The Phoenician, A Luxury Collection Resort, which has plenty to boast of in its own right, including the 22,000-square-foot Centre for Well-Being. With a spa this indulgent, working off a Thompson-inspired dish is as much a guilty pleasure as eating it. Venture to wine country for reasons other than the vino and take a seat in this sophisticated restaurant that exhibits a rare combination of world-class dining and impeccable yet personable service. Maître d' Nick Peyton charms guests with a swoon-worthy caviar and Champagne cart before they are steered into a wine country frame of mind. Chef-owner Douglas Keane prepares items from his prix-fixe menu that allows diners to choose three to five courses of contemporary cuisine with French, seasonal and global influences. We mustn't forget to mention Cyrus' impressive and lengthy wine list. Perched atop one of the prettiest cliffs in south Laguna Beach, this ocean-view eatery was master-engineered by chef James “Jimmy” Boyce, one of our top Regional Chefs in 2004. His dedication to local, farm fresh and artisanal ingredients is evident in the California-Mediterranean cuisine, and Boyce has trained many of the Montage’s culinary staff resort-wide. Whether you order à la carte or prix-fixe, a meal here is guaranteed to be expensive, but there couldn't be a better spot in Orange County for that very special occasion. The restaurant also boasts a personal sommelier for pairing your dishes with selections from the 900-label wine list. Legendary chef Wolfgang Puck and prominent architect Richard Meier paired up to transform the ultra-classic dining room in the Beverly Wilshire hotel into a modern, elegant and chic spot. The restaurant, styled with black-and-white paintings and vines growing along the wall, features an open kitchen that gives amplitude to the room. Puck prepares innovative takes on traditional steakhouse fare such as Kobe steak sashimi, foie gras sandwiched between spiced tuiles and asparagus with a poached egg—and that’s just to start. Sure, it's fun to talk about the fact that Ron Siegel was the first American to defeat an Iron Chef on the eponymous Japanese cult TV show. His fifteen minutes of fame, however, are nothing compared to the real reason Siegel deserves his laurels: his Eastern-influenced French cuisine on the menu at The Dining Room. 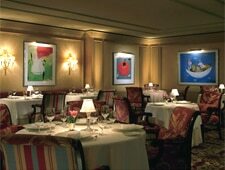 Considering this restaurant's long-standing reputation, developed under such chefs as Gary Danko and Sylvain Portay, Siegel's accomplished helming of this landmark property is particularly notable. As a result, it remains a fitting ornament for one of San Francisco's classic hotels. Of all the movers and shakers that frequent Michel Richard Citronelle, chef Richard himself arguably is most deserving of the spotlight. This is saying a lot in a city filled with influential politicos, but we stand by our assessment, and we're sure you'll agree from the moment you take your first bite. Like the hotel, the dining room is subtle, all the better to complement Richard's theatrics in the exhibition kitchen. Known for revolutionizing French-California cuisine, he now wows with an extravagant nine-course tasting menu. Like what you’ve nibbled? Then we suggest you take one of his innovative cooking classes. 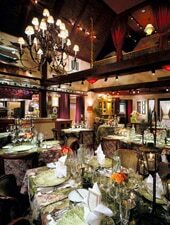 Many Second City denizens believe this classic and stylish restaurant to be second to none. Chef-owner Gabino Sotelino, with the help of chef de cuisine Christian Eckmann, prepares innovative French food from pâté to soufflé. The elegant Art Nouveau dining room, with its dark woods and soft edges, evokes memories of great rooms past, but the cooking is rooted in the present. The offerings change seasonally and dégustation menus abound, so there is ample reason to keep coming back for more. In the evolution of Las Vegas as one of the capitals of the world of gastronomy, the arrival of Robuchon was a milestone. 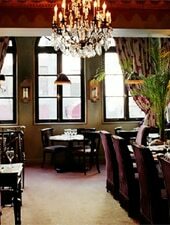 With namesake restaurants in Paris, Tokyo and, most recently, New York, Robuchon is the Manet of the ovens and among the culinary elite. Dine among Art Deco-inspired décor and feast on French fare served via two dégustation menus, composed of ten or sixteen courses and paired with a selection of wines by the glass. Stated simply: there's only one Robuchon in the world, and an evening here is a unique and unforgettable experience. Another globetrotter with an international gourmet empire, Jean-Georges Vongerichten has made a celebrated name for himself with a foundation that is classic French and influences from the time he spent in Asia mastering his craft. Still, this flagship restaurant—the centerpiece of his domain—at the Trump Tower continues to set the standards. Executive chef Mark LaPico admirably tends to the day-to-day, which is complemented by Adam Tihany's Trump-worthy interior design. Using strictly seasonal and truly regional ingredients from the restaurant's twelve-acre farm, Jerry Traunfeld practices what most restaurants only preach. Nine-course menus are finalized hours before the meal, ensuring freshness and quality from both land and sea. Begin your dinner with an apéritif or herbal tea and a tour of the garden, where your hosts will discuss and sample the herbs starring in the evening's menu. The Herbfarm is the Northwest's quintessential dining experience.